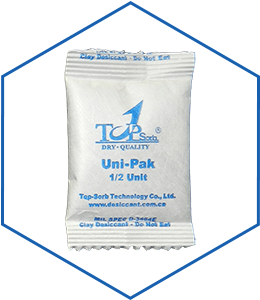 Clay desiccant is also called montmorillonite desiccant, known as a green desiccant sachets product due to its absolute safety and 100% environmental friendliness. 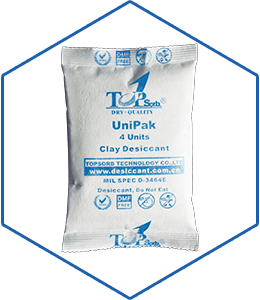 It is non-toxic and non-rusty, containing no any resolvable material and calcium chloride. 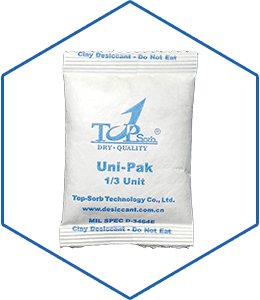 Uni-Pak clay desiccant is designed and produced based on “Unit” according to the standards of DIN55473 and MIL-D-3464E. 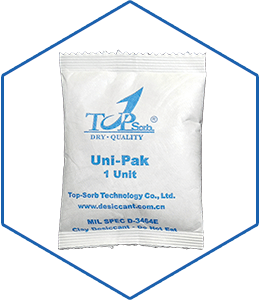 Topsorb has strict quality control for its adsorption capacity, strength, dust etc. 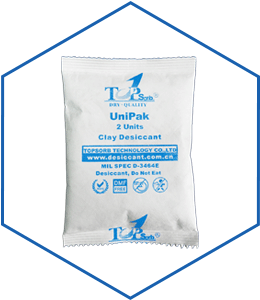 With our own bentonite mine, the bentonite clay we use as absorbent has more than 95% montmorillonite in purity, much higher than other clay desiccant products at home and abroad. 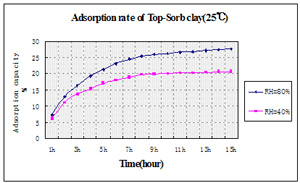 Its adsorption reaches 18%~20% at 40%RH. The package of laminated non-woven we use has excellent strength and tight structure to avoid damage and dust pollution. 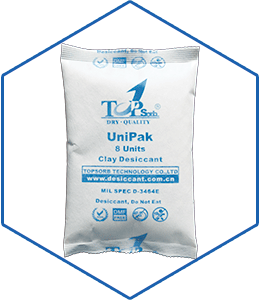 Uni-Pak clay desiccant is widely used in precision machinery, instrument, medicine, electric and metal products and war-industry products etc. 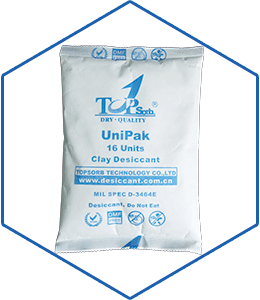 Bentonite clay’s main chemical component is montmorillonite, which is scalelike and with the color of white, grey, buff, pink, purple etc. It is a natural non-metallic sedimentary or volcanic mineral. Some are with porous structure, some are hard and brickle, some are soft and satiny. The simplest chemical molecular formula of montmorillonite is Al2O3•4SiO2•3H2O, theoretically, it consists of SiO2(66.7%)、Al2O3(25.3%)、H2O(5%). However, its factual component is much more complicated. Montmorillonite produced at different places is quite different in its components.